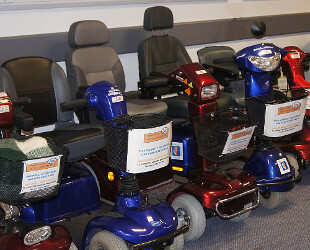 Our aim is to assist people with mobility impairments, temporary or permanent, to get around the locality. We receive an annual grant from Bracknell Forest Council towards our running costs and Bracknell Regeneration provides us with our Princess Square premises. We charge an annual membership fee of £30.00 and have charges for non members. Please see our Equipment page for full details of our hire scheme. The annual grant covering the vast majority of our running costs, received from Bracknell Forest Council, is being phased out in the near future. Fund raising is therefore a priority. You can help us to cover our costs in many ways. So please go to our Fund Raising page to see how. Our friendly and helpful team of staff and volunteers will help you choose the right equipment to suit your needs and provide you with tuition on using it safely and confidently. We provide a meet and greet service at various locations, see our Contact Us page for maps. See our Equipment page for our full range of scooters and wheel chairs. Please allow 15 minutes to complete the registration form and to receive instruction. Please bring with you proof of identity confirming your name and address e.g. a recent Utility bill, driving license, bank card. We will issue you with a membership card and on your next visit you can simply show your card. We are always after unwanted, books, DVD’s, CD’s, Bric-a-brac etc which we can sell to help raise funds. Please note we can not accept second hand clothing or second hand electrical goods.